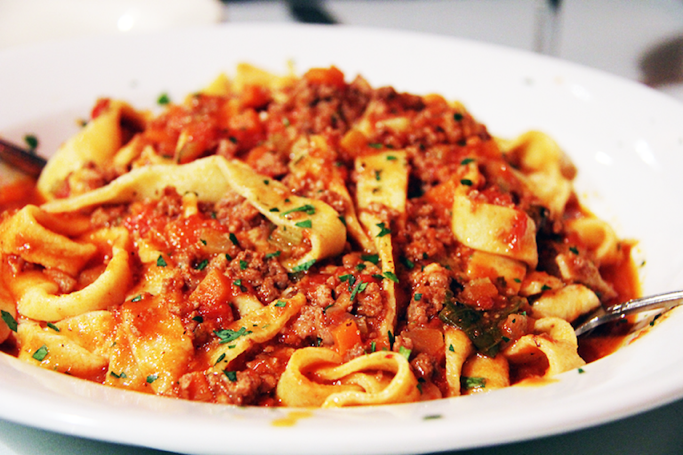 If you have had a delicious Pappardelle with Bolognese Sauce recently and would like to create the meal at home, then we have the perfect, easy recipe that is even great if made the day before. You will first start with a large frying pan/skillet on medium heat and add 1 tablespoon of the olive oil. When warm, add the Pork and Veal to the pan and then season with salt and pepper to taste. Cook both the Pork and Veal for several minutes until they begin to brown. Once you are sure they are cooked to your preferred liking take out of the pan and place in an alternate dish lined with paper towel. By placing the Pork and Veal on paper towel, any excess grease will come off of the meat. You will also cook the bacon, to taste, in a different pan and place that to the side on paper towel as well. While the Pork and Veal are to the side, you will now cook your vegetables. In a different pan, place another tablespoon of the olive oil in the pan on medium heat. Add the carrots, onions and celery to the pan and cook until they are soft but definitely not brown. Add the garlic cloves and continue to stir for 2-3 more minutes. Add the Tomato Paste to the pan and stir into the other ingredients for another 2-3 minutes. Now add the Cooking Wine and let the pan simmer until all of the wine has been evaporated, which will take about 4-5 minutes. Cook the pasta separately and then add to the pan and combine well. Once all ingredients are combined, top with Parmesan Cheese and Serve. No Replies to "Pappardelle with Bolognese Sauce"